Burrard Thermal: A victim of private power? For the Georgia Straight, December 10, 2009. As the United Nations climate talks proceed in Copenhagen, the debate around green energy is taking on a life of its own in B.C. A natural-gas-fired power plant in Port Moody has taken centre stage in a complex fight that will determine B.C.’s energy future. The fate of the Burrard Generating Station (sometimes called Burrard Thermal), a power plant with the capacity to generate almost 10 percent of the province’s energy needs, has forced the topic of privatization into the debate about provincial energy strategy. 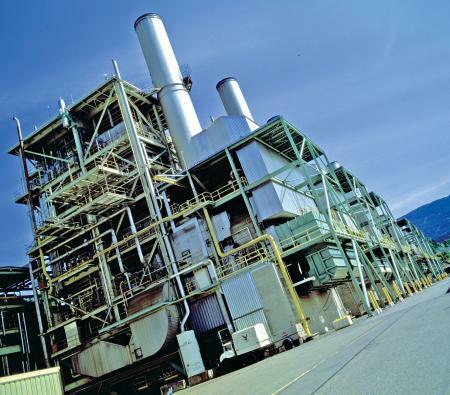 The province wants the plant used for emergencies only and has refused to count its potential power production for B.C. Hydro’s planning purposes. Environmental groups claim that the plant is being demonized, creating a smoke screen to enable the selloff of B.C. rivers for controversial private-sector run-of-river power projects. Yet other organizations are in favour of shutting the plant completely. These groups frame the debate as one between clean energy and dirty energy, and they support the development of private power. Sanderson’s views on Burrard Thermal are echoed by some activists, including Tzeporah Berman, founder of PowerUp Canada. Berman, who was recently named to sit on the B.C. government’s Green Energy Advisory Task Force, said that producing clean power should be everyone’s priority, be it B.C. Hydro or private power companies. But portraying Burrard Thermal as a “spewing plant” flies in the face of the province’s own reporting on emissions. The plant didn’t make the list of significant single-point producers of greenhouse-gas emissions in the province’s emissions inventory report for 2005, issued in July. Topping that list are two cement plants in Delta and Richmond and an oil refinery in Burnaby. Environmentalists and residents of Port Moody who want the plant to continue to operate as it has over the past five years say Burrard Thermal is the only thing standing in the way of B.C. Hydro buying even more power from private companies. Critics like Gwen Barlee, the policy director of the Wilderness Committee, say the government is using people’s fears to justify the slow-motion privatization of a profitable Crown corporation. “The government is using the excuse of climate change, which is the most serious issue to face the earth, as an excuse to privatize B.C. Hydro,” Barlee said. A heavily polluting power plant perched on the shore of the Port Moody Arm of Burrard Inlet isn’t something anyone in the Lower Mainland wants to see, including the people who want to see the plant continue operating. For the past five years, the plant has only kicked in when electricity demand peaks in the cold winter months, acting as a standby electricity generator for the Lower Mainland. Its power is available on demand, and it has been used when ice storms and forest fires threaten transmission lines, as well as when the demand for electricity is highest. In 2008, the plant generated only 300 GWh (gigawatt-hours) of electricity, a fraction of one percent of the almost 53,000 GWh that Hydro generated that year. It has been regularly maintained and fitted with filters that have greatly reduced the chemicals contained in its emissions (including a 90-percent decrease in smog-forming pollutants). “The plant rarely ran at full capacity,” said Elaine Golds, a long-time resident of Port Moody. “It’s kind of like the 20-year-old car that’s only been used to drive to church on Sundays,” she said. The plant was built in 1963, after which time dams along the Columbia River were completed, reducing the need to generate electricity in the Lower Mainland. “Burrard Thermal has been a part of our landscape for so many years that it’s part of the community,” Port Moody city councillor Karen Rockwell told the Straight. From a lookout point near Golds’s home in the hills of Port Moody, it was tough to see the plant across the inlet because of the fog and clouds. Some of her neighbours walked by, clad in raincoats and boots, and commented that since the plant is only used in the winter, they only hear some noise once in a while but don’t really even notice that it’s there. “Of course, there are some individuals [with misgivings], but the general community does not have concerns with operations at Burrard Thermal,” Port Moody mayor Joe Trasolini told the Straight before a council meeting. According to Golds, the government is exaggerating the plant’s contribution to air pollution. She was a member of the City of Port Moody’s Burrard Thermal Liaison Committee, a group made up of citizens of Port Moody and representatives of B.C. Hydro and the municipality whose mandate was to determine the community’s vision for the plant. The committee passed a resolution in 2007 that Burrard Thermal should continue to be maintained and relied on for emergency power beyond 2014. The province’s B.C. Energy Plan in 2007 called for Burrard Thermal to be phased out by 2014 and also directed B.C. Hydro to budget for energy “insurance” by producing more electricity than the province generally uses each year. The energy plan, which looks exclusively at electricity generation, gives direction to B.C. Hydro, which then formulates a long-term acquisition plan (LTAP). Once the LTAP is prepared, it is presented to the B.C. Utilities Commission, which oversees B.C. Hydro on behalf of ratepayers, for approval. Over the summer, the B.C. Utilities Commission rejected parts of Hydro’s latest LTAP and specifically recommended that Burrard Thermal continue to be used for planning purposes to account for 5,000 GWh of power every year to meet the energy-insurance requirements. “We are looking to enhance our environment, and I think it’s fair to say that if Burrard was to run at the magnitude that the [B.C. Utilities] commission said that it could, it would be the single largest emitter of greenhouse gases in the province,” Blair Lekstrom, minister of energy, mines, and petroleum resources, told the Straight over the phone. The B.C. government overruled the BCUC in an October 28 announcement, in which they removed the planning capacity from Burrard and reaffirmed that B.C. Hydro must acquire an additional 6,000 GWh of power from independent power producers. Lekstrom said that his government had made it clear from 2001 that Burrard Thermal would not be part of B.C.’s electricity generation, and he called his government’s choice to intervene in the independent regulator’s ruling “a clarifying position”. B.C. Hydro spokesperson Susan Danard said the province’s announcement changes the way planning will be done for Burrard Thermal, but she isn’t sure that it will result in a huge change in the day-to-day operations of the plant. There are 77 employees at the plant, 15 of whom are unionized members of COPE Local 378. “We haven’t heard anything; we don’t suspect anyone will lose their jobs, because it will just be business as usual,” COPE representative Lori Winstanley told the Straight during a break from November’s B.C. Federation of Labour convention in Vancouver. According to Danard, operating and maintenance costs at Burrard Thermal were $20 million in fiscal 2009 but it’s too early to say what the financial impact of the government’s announcement will be. The plant pays $1.5 million annually in taxes to the City of Port Moody. Port Moody’s mayor agrees with Shaffer’s assessment, and he said he expects the plant to continue operating as it has during the past five years. “Frankly, the announcement was just a way for the government to remove any possibility of Burrard Thermal being used as an excuse to not go to the run of the river,” Trasolini said. “As long as it [Burrard] was to be included in the planning for B.C. Hydro, the ability to go secure clean, renewable electricity wasn’t there,” Energy Minister Lekstrom said. B.C. Hydro will be paying about $100 per megawatt-hour for power that will be backing up the system, Shaffer said, which will usually be surplus and that B.C. Hydro will sell on the open market, where prices are below $70 per MWh over the long term.